Converting to symmetrical low beam when driving abroad: switch the headlamps to symmetrical low beam in countries in which traffic drives on the opposite side of the road to the country where the vehicle is registered. This prevents glare to oncoming traffic. Symmetrical lights do not illuminate as large an area of the edge of the road. Have the headlamps converted at a qualified specialist workshop, e.g. an authorized Mercedes-Benz Center, as close to the border as possible before driving in these countries. Converting to asymmetrical low beam after returning: have the headlamps converted back to asymmetrical low beam at a qualified specialist workshop, e.g. an authorized Mercedes-Benz Center, as soon as possible after crossing the border again. automatic headlamp mode/daytime running lamps is located on the light switch. 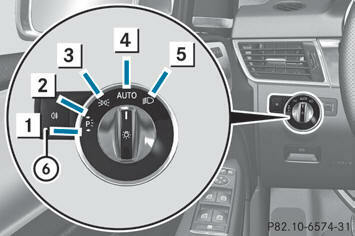 The turn signals, high-beam headlamps and the high-beam flasher are operated using the combination switch. - Turn the light switch to . lamps and the parking lamps are switched on. - To activate the daytime running lamps: activate the daytime running lamps function in the on-board computer. With the engine running: depending on the brightness of the ambient light, the daytime running lamps or the low-beam headlamps are switched on or off automatically. - To switch on the rear fog lamp: turn the SmartKey in the ignition lock to position 2 or start the engine. if the lowbeam headlamps are on. - To switch off the rear fog lamp: press the button. (SmartKey in position 1 in the ignition lock) and then restart it, the previous rear fog lamp settings are restored. the rear fog lamp only lights up if the lowbeam headlamps are on. The headlamps are cleaned automatically if the "Wipe with washer fluid" function is operated ten times while the lights are on and the engine is running. When you switch off the ignition, the automatic headlamp cleaning system is reset and counting is resumed from 0. - To indicate briefly: press the combination switch briefly to the pressure point in the direction of arrow 2 or 4. - To indicate: press the combination switch beyond the pressure point in the direction of arrow 2 or 4. - To switch on the high-beam headlamps: turn the SmartKey in the ignition lock to position 2 or start the engine. - Press the combination switch beyond the pressure point in the direction of arrow 1.
instrument cluster lights up when the high-beam headlamps are switched on. 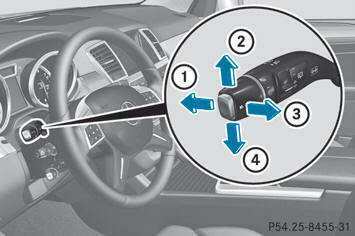 - To switch off the high-beam headlamps: move the combination switch back to its normal position. - To switch on: turn the SmartKey in the ignition lock to position 1 or 2 or start the engine. - Pull the combination switch in the direction of arrow 3. - an air bag is deployed. - the vehicle is slowed down severely from a speed of over 45 mph(70 km/h) and comes to a halt. - To switch off the hazard warning lamps: press button 1. The hazard warning lamps are deactivated automatically if the vehicle returns to a speed of over 6 mph(10 km/h) after a full application of the brakes. operate if the ignition is switched off. - To activate: activate the Adaptive Highbeam Assist function using the onboard computer. indicator lamp in the instrument cluster lights up. the headlamp range is set automatically depending on the distance between the vehicle and other road users. indicator lamp in the instrument cluster stays on. - To deactivate: move the combination switch back to its normal position. The Adaptive Highbeam Assist is only an aid intended to support you while driving. The driver is and remains responsible for proper vehicle lighting in accordance with the prevailing light, sight and traffic conditions. - Road users whose lighting is obstructed, e.g. road users behind a guardrail - In some seldom cases, even road users with a lighting system of their own may be recognized too late or not at all. The automatic high-beam headlamps will then not be deactivated or it will be activated in spite of preceding or oncoming road users. This could endanger you and/or others and cause an accident. Always pay close attention to the traffic situation and switch off the high beam manually if necessary. - Drive with the headlamps switched on. If the level of moisture does not diminish: - Have the headlamps checked at a qualified specialist workshop.